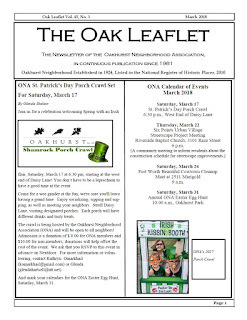 Oakhurst Neighborhood Association, Fort Worth, Texas: Get Your March Oak Leaflet! Get Your March Oak Leaflet! Check out this month's issue of The Oak Leaflet online! Details on ONA's upcoming Shamrock Porch Crawl and other events are provided. You'll find Elizabeth's President's Column, of course, along with some helpful tips on bicycle safety for your children. Those curious about all of the nearby development projects will want to check out the update on page 6, too!